You know when you decide to spawn your own minions, aka have a child, you'd end up with bunch of schtuffs you have no clue what to do with after they are older. This woman here? Guilty! I've made Goodwill a very happy recipient though so, that's a win there. Now while I got rid of A LOT, I saved some that I can repurpose for home decor at our new and bigger house. No joke, there was more space to decorate and heck, I wasn't ready to break my already broken bank by buying additional home decor to pretty up the new house. Me haz creative talent, so me haz to utilize it! 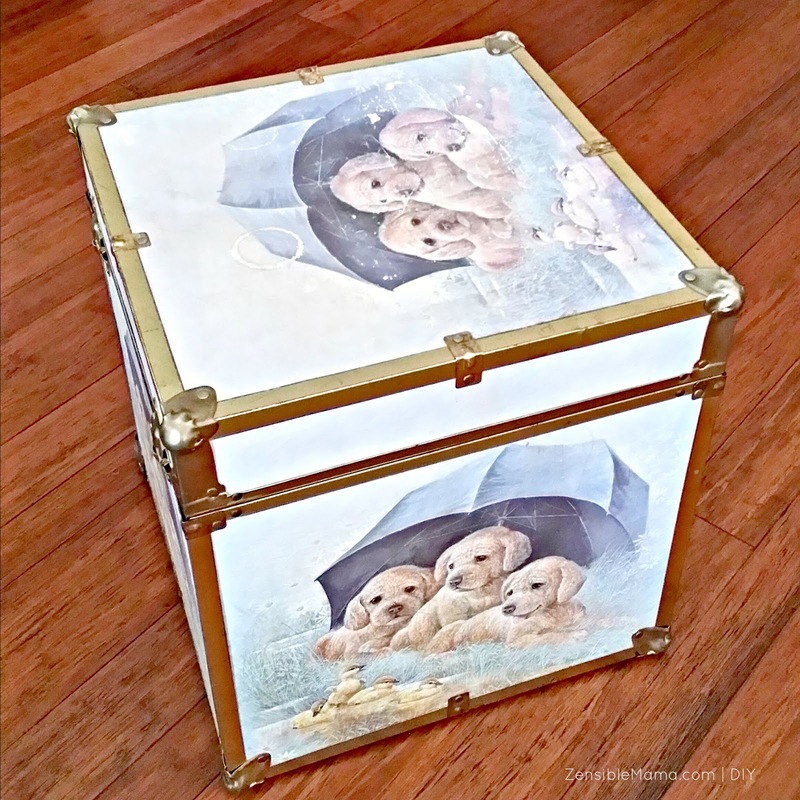 In the creative table was this old, stained square trunk box that used to house more toys that my daughter can keep up with, which I transformed into an adorable, contemporary storage box that now holds a permanent spot next to my coat tree. Go see. This project is easy and simple to do. Delta Soy paints are eco-friendly and water-based which means you can control its viscosity. Note. This trunk box is covered in paper print but that rule about not painting over a paper/wallpaper BS is just that, BS. If you do it right, it works. Let's get to work. 1. 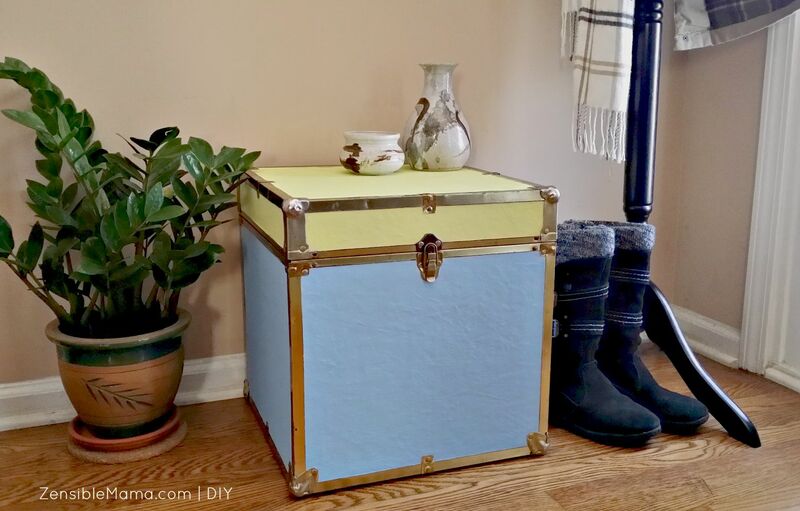 Before applying your first coat of paint, make sure the surfaces are free of dusts or gunk. Or you'll have clumps and you won't want that. 2. Apply your first coat. I started with a thinner mixture and worked on the edges with the watercolor brush, painting closely on the metal edges. If you're not confident about not smearing, apply the blue paint tape on the edges first, then paint. In this project, I painted the bigger square surfaces first since they require the most work. 3. Using the wide paint brush, apply the Blue Sky. Apply 3 coats. Give ample time in between coats if you see that the surface is overly damp. 4. Next work on the accent color. Apply Cucumber paint and apply 3 coats or more to achieve your desired color intensity. 5. Let it dry for a day then use as you please. That's it. Enjoy your work! And if you like this project, please share it.